THE STORY - Members (Anton Yelchin, Alia Shawkat) of a punk-rock band and a tough young woman (Imogen Poots) battle murderous white supremacists at a remote Oregon roadhouse. Jeremy Saulnier's career received a huge boost with his second feature-length film "Blue Ruin." His follow-up, "Green Room," finds him still working with nuts and bolts low budget filmmaking techniques (Albeit, a slighter larger budget this time around) and with a more well-known cast. And while the results are not as staggering as "Blue Ruin," he still manages to create a film that deals with primal survival in a very visceral and terrifyingly realistic manner. A young punk band named “Ain’t Rights" is traveling through the Pacific Northwest searching for their next gig. After a string of bad luck lands them with little cash, they take an impromptu gig at a warehouse run by a bunch of Neo-Nazi skinheads. They play the show and think that they will simply go home. 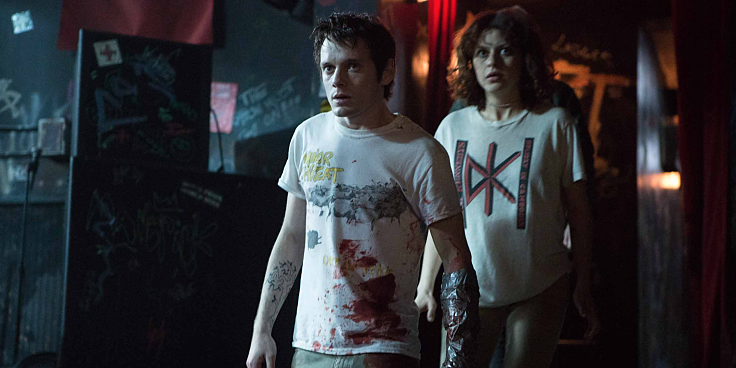 Unfortunately, Pat (Anton Yelchin) witnesses the aftermath of a gruesome murder in one of the back rooms. Suddenly he, Tiger (Callum Turner), Reece (Joe Cole), Amber (Imogen Poots) and Sam (Alia Shawkat) are being told by Gabe (Macon Blair) to stay put while the authorities are called to deal with the situation. However, what Gabe is up to is he's reaching out to his boss Darcy Banker (Patrick Stewart) to come and clean up the situation. Now locked in a room and with an army of maniacs outside their door, the young group must decide how to stay alive at any cost. What separates "Green Room" from all of the other traditional modern day horror films that we have to endure every year, is how grounded it is in realism. The acting from the young ensemble headed by Imogen Poots and Alton Yelchin is superb in how it portrays their shock, horror and will to survive despite the overwhelming odds that have been stacked against them. And those odds are lead by a chilling performance from famous English actor Patrick Stewart (Most audience members will recognize him from the "X-Men" series as Professor Xavier). He uses his stature and expertly placed body language to create a performance that is cold, reserved, and fearful. It's unlike anything else he has done before. Saulnier keeps the pace moving at a breakneck (Or arm?) speed throughout. His expert control over atmosphere and tension is on display throughout and there are certainly a number of scenes that will make you jump and widen your pupils with its gritty violence. In typical thrillers, the villains would use guns, but here the ammo is limited and the weapons of choice are anything that will produce an easier clean up after the job is done. That means lots of knives, machetes, box cutters, and vicious flesh-eating dogs. If it all sounds too stomach wrenching for you, then it probably is. This is an exhilarating thrill ride, but with one glaring flaw. There is a lack of depth to the proceedings, which unfortunately holds the film back from resonating on a deeper level. The first time viewing will be fun due to how much it will disturb. The second time viewing experience might be fun if you're watching your friends reactions. But beyond that, there's not much else within "Green Room" to provide to truly make it a memorable film. Three films in and Saulnier has proven that he certainly knows how to garner genuine performances from his cast and craft a simplistic script that strips down all other side elements so he can concentrate on the atmosphere he is trying to build. If there is one word that would sum up his filmography so far, it's dread. The sense of dread within "Green Room" (And also "Blue Ruin") is palpable, allowing Saulnier to manipulate the audience however he see's fit. Seeing as how "Green Room" shares many similarities with "Blue Ruin," I am excited and anxious to see where the unmerciful mind of Jeremy Saulnier will take us to next.